The two competing immigration bills up for a vote in the House on Thursday offer significantly different amnesty provisions, and would have very different effects on future immigration flows. The so-called "compromise bill" crafted by House Speaker Paul Ryan would result in a net increase of 2.12 million more green cards through amnesty and chain migration over the next 15 years. In contrast, the bill crafted by Rep. Bob Goodlatte (HR 4760) would result in a net decrease in green cards of 1.23 million over the next 15 years because it offers a much smaller amnesty and makes prompt, deep cuts to chain migration categories. 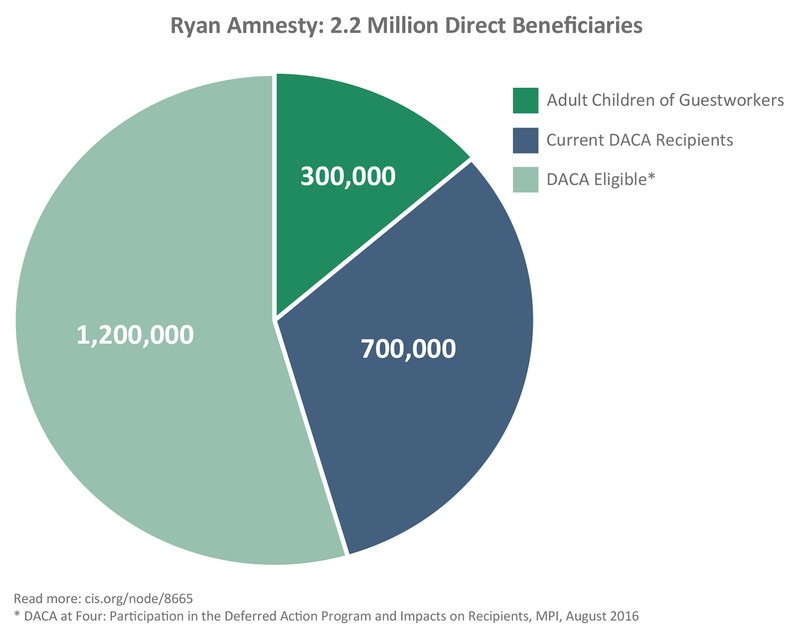 Here are the details behind the calculations: The Ryan bill offers amnesty and a path to citizenship for an estimated 2.2 million direct beneficiaries. This includes an estimated 1.9 million aliens believed to be potentially eligible for the proposed amnesty, which has the same basic qualifying criteria as President Obama's Deferred Action for Childhood Arrivals (DACA) program (arrived in the United States before 2007 while under age 16, continuous presence for at least five years, and present illegally in June, 2012). This population includes those who could have but did not apply for DACA or who were too young to apply. 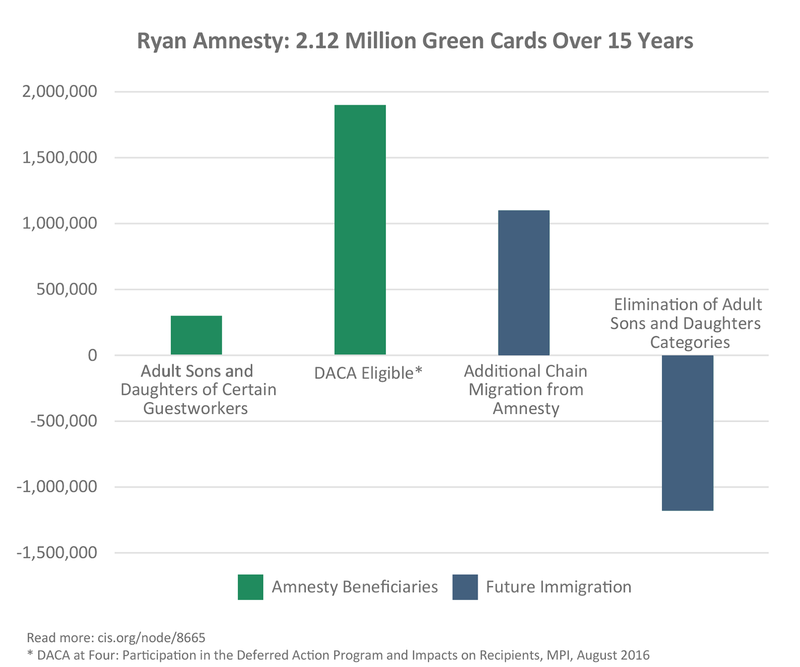 The Ryan amnesty also includes a group that is brand new to the amnesty debate: adult sons and daughters of certain guestworkers who arrived while younger than 16, who have lived in the United States for 10 years, and who are too old to qualify for green cards or temporary visa renewals. These are adults whose parents were admitted more than 10 years ago as temporary non-immigrants in one of three categories: Treaty Traders/Investors (E category), Specialty Occupations (H-1B), and Intra-company Transferees (L). All of these categories have been controversial because of fraud and/or displacement of American workers. Based on official statistics on the number and ages of temporary visa holders admitted in the relevant years, I estimate that approximately 300,000 aliens could qualify for amnesty in this category. The Ryan bill preserves the largest chain migration categories (unlimited spouses and parents of naturalized citizens) and eliminates other chain categories (adult married sons and daughters of naturalized citizens and siblings of naturalized citizens) and the visa lottery. These numbers are reserved for use by amnesty beneficiaries and employment-based applicants. After these applicants are accommodated, the lottery and adult married sons and daughters categories are eliminated, resulting in an annual reduction of 78,400 green cards. Meanwhile, the additional green cards from the large amnesty and the additional chain migration would cause an annual increase of about 220,000. The result is a net increase of 2.12 million green cards over 15 years (3.3 million amnesty plus chain beneficiaries minus 1.18 million fewer chain and lottery green cards). In contrast, the alternative bill, known as the Goodlatte bill (HR 4760), includes a more limited amnesty and deeper cuts to chain migration. The Goodlatte amnesty would be available to about 700,000 aliens who received work permits and deportation protection under President Obama's DACA program. The amnesty does not include a direct path to a green card or citizenship, so beneficiaries would not be able to sponsor family members. Therefore, there would be no chain migration resulting from the amnesty. In addition, the Goodlatte bill would eliminate several large chain migration categories and the visa lottery. The categories eliminated (after one year) would be: adult sons and daughters of naturalized citizens and permanent residents, and siblings of naturalized citizens. In addition, the category for parents of naturalized citizens would be replaced with a temporary visa for parents, although the parents of naturalized amnesty beneficiaries would not qualify. Together these provisions would reduce legal immigration by approximately 138,000 per year (accounting for the one-year grandfathering of chain green cards). This would result in a net decrease of about 1.23 million green cards over 15 years (138,000 times 14 years minus 700,000 amnesty beneficiaries).